“In the current circumstances I see myself as no longer able to guarantee the robust defense force I believe is necessary to guarantee the protection of France and the French people, today and tomorrow, and to sustain the aims of our country,” De Villiers said, as cited by French media. He added that Macron had accepted his resignation. The open conflict between the head of state and the chief of armed forces started earlier in July when France’s Budget Minister Gerald Darmanin announced military budget cuts. According to the proposed budget cuts, the Defense Ministry will have to make savings of €850 million (US$980 million). The Interior and Foreign Ministries also had to face budget cuts. De Villiers, 60, protested the cuts before the parliamentary committee. Macron slapped down De Villiers, saying that he has “have made commitments” and he was De Villiers’ boss during his traditional annual address to the army where top army officers and their families were present. “If the [Armed Forces] chief of staff has an issue with the President of the Republic, the chief of staff will be changed,” Macron added in an interview to Journal du Dimanche newspaper. “Armies basically obey. So in substance the president was within his rights to restate his authority… But the way he did it will leave marks. You cannot publicly question a military leader like that in front of his subordinates,” former chief of the French armed forces Henri Bentégeat told Le Monde newspaper. 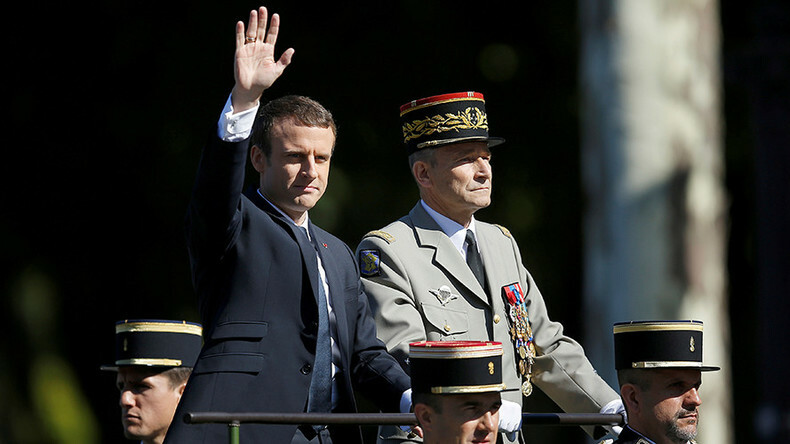 “When Macron attends the first ceremony for a soldier killed because of a lack of equipment, all the criticism will be directed at him,” Bentégeant added.